Doing a little vacation time internet surfing, I stumbled across these. Apparently, life made me totally miss these in 2006. 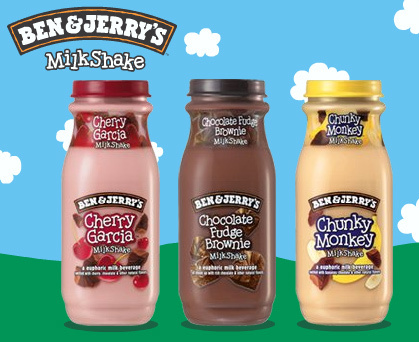 According to USA Today, these Ben & Jerry's milkshakes were made by Pepsi and sold in Cherry Garcia, Chocolate Fudge Brownie, and Chunky Monkey. Oh to enjoy 8 fluid ounces of "a euphoric milk beverage". Despite unending praise, the flavors didn't survive long.... It's a shame, especially after reading Marvo's comments on flickr. Ok, sorry to make everyone hungry/thirsty for a shake.